Summers in Dallas, TX can reach desert-like temperatures. Cooling down is a necessity. This is more than enough reason to make sure that the pool area is in tip-top shape. But have you ever tried stepping into an unpleasant concrete pool deck and felt immediately turned off? 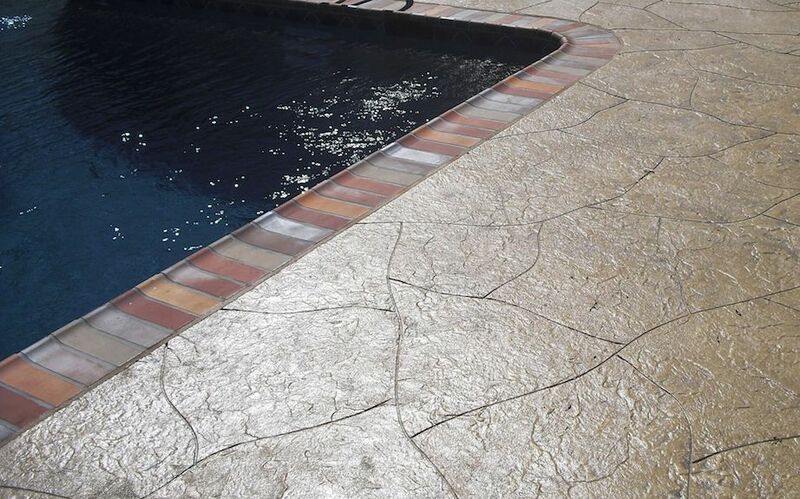 Cracks, spalling, and discolored concrete are just some of the most common damage that pool deck owners have to deal with. 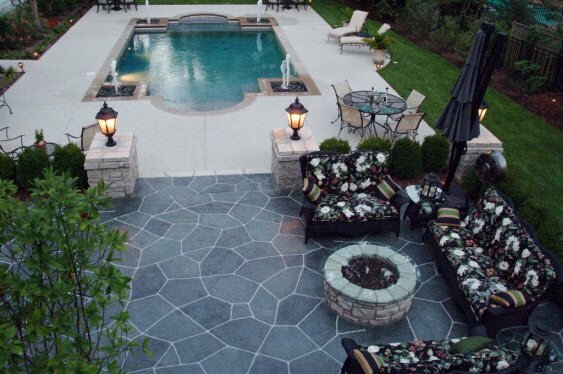 But there is no real reason to freak out because reliable and affordable decorative concrete solutions are now available for both residential and commercial pool decks. Pool Deck Resurfacing – Resurfacing is the process of replacing the top layer with a new layer of overlay or coating. This is an ideal solution to surface damage, such as cracks, spalling, and scaling. 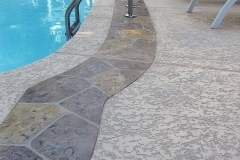 This is also a great option if you want to update the look of your concrete pool deck and make it more slip-resistant. Pool Deck Refinishing – Refinishing is the process of changing the finish of a concrete deck without replacing the top layer of the concrete slab. This is ideal for covering stubborn stains and discolored areas. 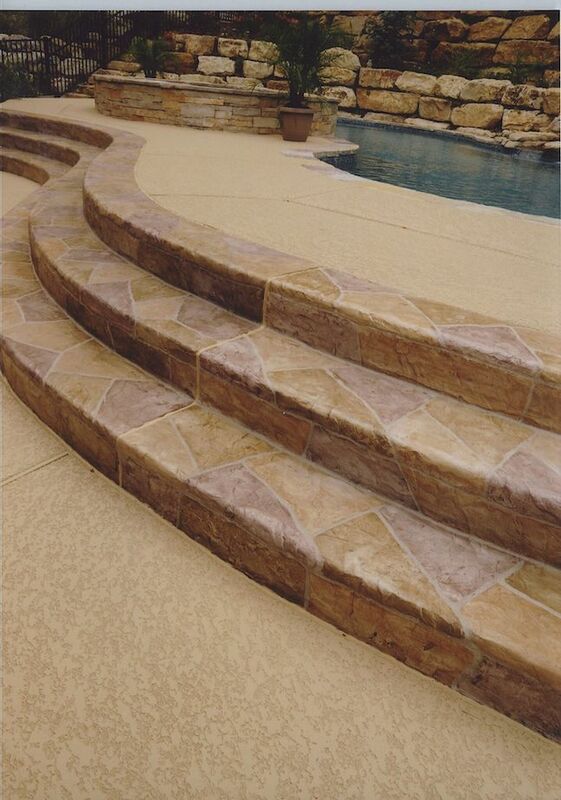 Popular refinishing options are concrete stains and pool deck sealers. 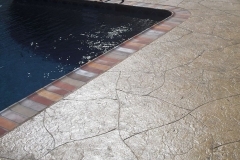 Pool Deck Repair – Most damages to pool deck concrete are repairable. Cracks and holes can be filled. Working cracks can be incorporated into the design through custom scoring. Dull surfaces can be sealed or resealed for that extra shine and protection. 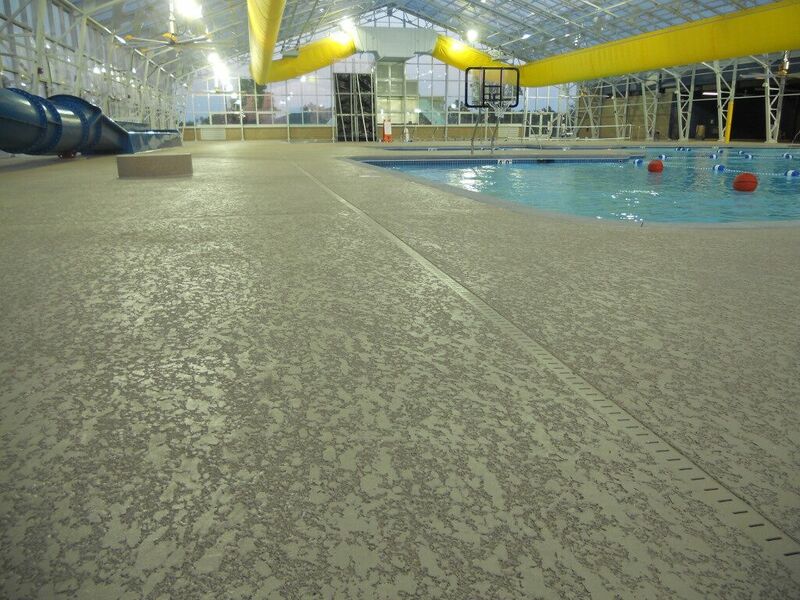 Stamped Concrete Overlay – This is a cementitious overlay that is laid out on the pool deck to cover up minor damage, such as cracks and holes. It creates a blank canvas for more decorative patterns which are imprinted on the overlay via stamping. 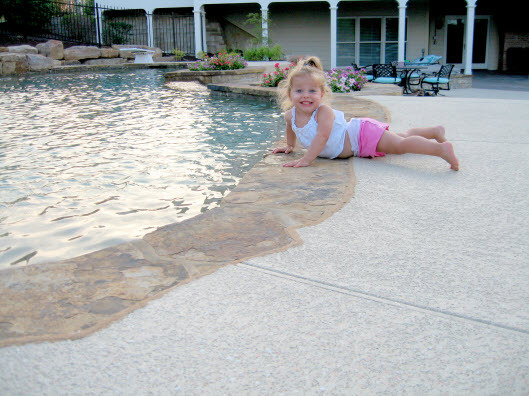 The most coveted stamped concrete pool deck patterns include brick, tile, and stone. The grooves created in stamping make the surface realistic and slip-resistant. 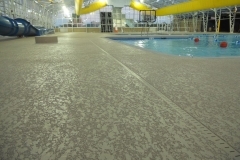 Spray Knockdown Texture – An acrylic concrete coating is loaded into a hopper gun and applied on the pool deck via a spray-down method. The splattered coating is knocked down with a trowel to make a slip-resistance surface that is safe to walk on. This coating is also a cool option because it literally remains cool to the feet even in the hottest summers. 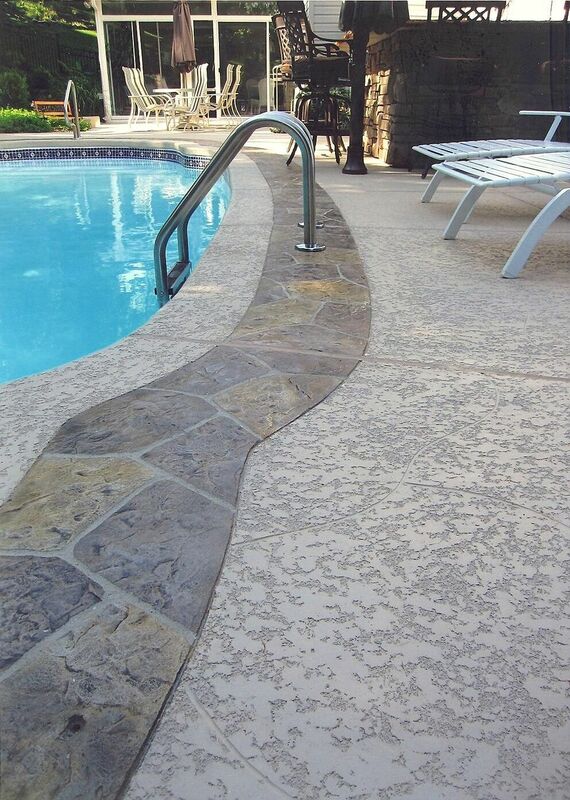 Stained Concrete – A concrete pool deck is prone to stains and discoloration especially since it is right beside a swimming pool. If the deck looks unsightly, you can change the color to a more pleasant one. 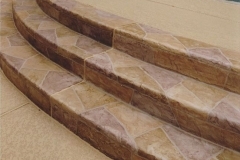 Acid stains are ideal if you want the random effects and varying color tones often found on natural stones. Water-based stains are more consistent and solid in color, great for custom designs. Call (972) 885-6067 to meet and discuss with one of our pool deck experts! When it comes to the level of service, our high standards set us apart from other Dallas concrete contractors. Dallas Concrete Artisans is a decorative concrete company that is well-trusted and highly-rated when it comes to resurfacing, refinishing, and repairing concrete pool decks, patios, driveways, and other concrete surfaces. Interested in a free consultation? We will discuss your project and you can share your ideas until we both get a good understanding of what it is you want. We will do the necessary measurements and take photos as well so we could make a good plan and provide you with an accurate quote. All of this at no extra cost. Call us!